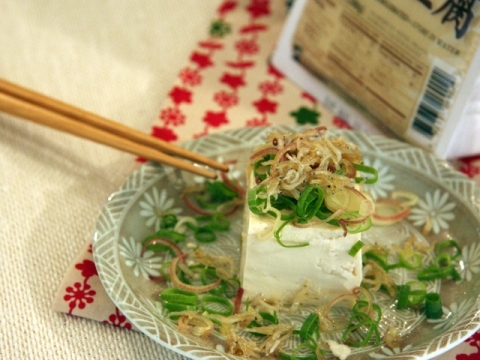 Anchovy will make regular Cold Tofu more enjoyable! As seen on TV AD! 1. Cut tofu, and drain water after a while. 2. Chop green onion and myoga ginger and put them on top of tofu. 3. Warm up frying pan with sesame oil, and cook anchovy quickly. 4. Put anchovy (including entire sesame oil) on top of tofu followed by soy sauce.